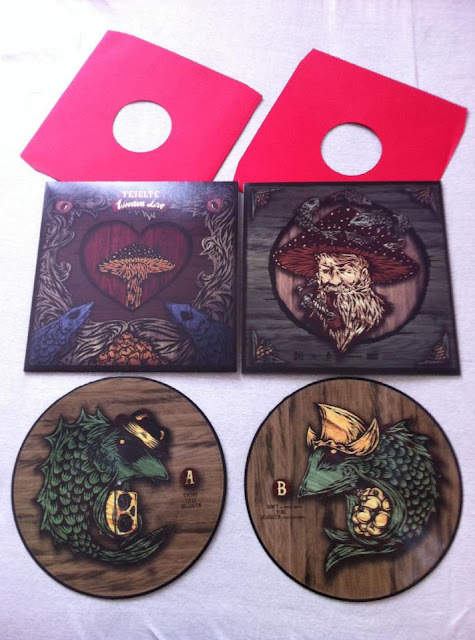 Wooden Love EP by Teielte, released by a very energetic and eclectic label U Know Me Records is the best what Polish glitchy / mutant / funky nu beat scene can offer right now and on top of that a vinyl has a form of most beatiful picture disc. Hurry, there are only 300 pieces of this masterpiece available. U KNOW U WANT THIS! Check e.g. Asphalt Shop, hhv.de or juno.co.uk and grab a copy. I'm really proud we have such artists in Poland, producing top quality stuff and fully aware of the direction in which they want to develop their music. Since his debut album, Homeworkz (read my review here) Teielte has grown and matured beyond my expectations. Wooden Love includes six very solid, immaculately produced and fantastically arranged compositions. Every second is fully packed with tasty, vibrant sound, broken drums and highly addictive beat. The artist takes care of every detail, and what is a trademark of his style - pays great attention to all background samples, bleeps and beeps. There are no fillers here, just the essence of intelligent contemporary electronica. Synth-laden, neon Selcouth and banger par excellence Dont (a collaboration with Daniel Drumz another hot name from U Know Me roster) have already become major hits, while Tripf, Easy and Fire show the astonishing range of Teielte's inspirations and skills. Five originals are nicely supplemented by Liquid Molly's remix of Selcouth. A slow-burning dub trip which squeezes even more power from neon synths of the original. For me personally, Wooden Love is the best release this year (so far) not only in Poland but also across the world. Highly recommended by Doktor Krank. Teielte - Selcouth [UKM 011] from U Know Me Records on Vimeo.